1Host Review 2019: Is 1Host a Good Hosting? A no-frills provider offering simple plans with high quality hardware. An American-based company which has been in business since 1996. 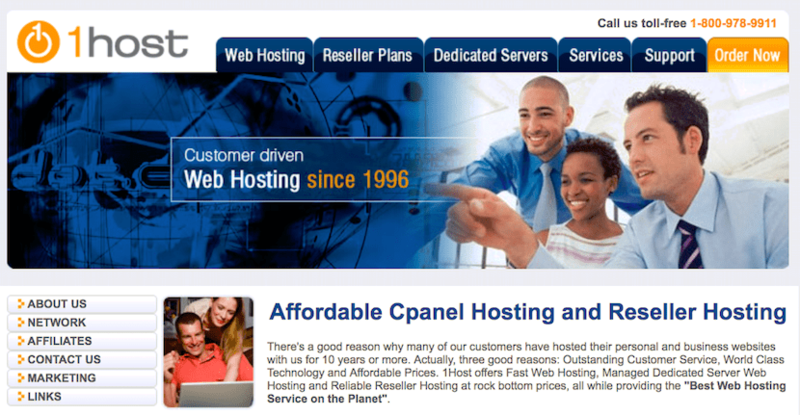 Founded in 1996, 1Host is a U.S. based website hosting provider. They don’t advertise how many customers they have, however, they are worldwide. They advertise that many of their customers have stayed with them for over eight years and this longevity is due to their three core values: great customer service, excellent technology, and affordable pricing. Their website and support are available in English. 1Host offers shared website hosting, reseller hosting, dedicated servers, SSL certificates, and domain registration. They also offer services such as website design, maintenance, and search engine optimization. For beginners, there are some great features. For example, for all plans except the basic plan they offer free of charge a website builder complete with pre-built templates, e-commerce ready integrations including checkout and cart functionality, and one-click installers for popular programs. They also offer an easy cPanel demo for beginners to try before paying. Also, experts will enjoy the top-notch hardware and infrastructure used by 1Host. Their servers are housed in a data center located in Atlanta. Their infrastructure is fully redundant, and has an uptime of 99.9% along with 24/7 on-site engineers. They use top-of-the-line servers, Dual Quad Core Xeon, with 12 GB Ram and RAID 10, meaning your websites will be served up to 30% faster than HDD. Unfortunately, their prices are quite high when compared to local American competition, and large international competitors. That said, the inclusions are quite extensive in all of the 1Host plans e.g., all plans include multiple domains and free SSL certificates. They do also offer quite good discounts when you purchase a longer term upfront. You can choose to buy in one month, three month, twelve, or twenty-four month terms. The discount increases up to 30% depending on the length of term. All plans include a 30-day money-back guarantee, however, there are no free trials or free plans. Sadly, their customer service is very limited and quite slow to respond. In fact, there is only a toll-free number and several email addresses. There is no live chat on the website. This is a shame and ideally, I’d like to be able to contact them and receive an instant answer. Furthermore, I found it pretty frustrating that they have a link to a knowledge base but it does not have any documents. 1Host has a no-frills website with simple, no-nonsense plans. They have some great, beginner-friendly features but experts will also like their dedication to top-quality hardware. Wondering how 1Host stacks up against other Web Hosting companies? Enter any other Web Hosting company and we will give you a side-by-side comparison.